A megaphone is a simple device created in a funnel-like shape to help direct and amplify sound. The megaphone transmits sound spoken through the narrow end of the funnel. Megaphones were used long before electricity began to power most of the things we use, including the microphones that are used at almost any occasion that requires amplification. When electricity isn’t handy, a megaphone can provide amplification. Kids can make megaphones from paper or paper plates you might already have around the house. Select the paper for the megaphone. 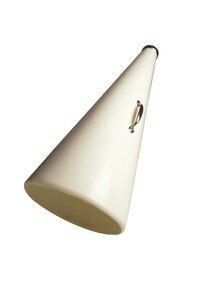 Copy paper makes a lightweight megaphone, while card stock makes a sturdier megaphone. Depending upon the reason for the megaphone, such as using it just for fun or for a special occasion, you can use either plain or colored paper. Lay two sheets of the paper together with the 11-inch sides overlapping by 1/2 inch. Glue the two sheets of paper together. Let them dry completely. Decorate the 8 1/2-by-22-inch sheet. Let young children use crayons or stickers to decorate their megaphones. Older children can use markers and create designs from templates. Roll the sheet into a tube with a 1-inch opening for the mouthpiece on one end. Make the other end of the tube as wide as possible. Tape the tube into shape using a strip of clear packing tape to anchor down the entire length of the tube. Cut three strands of ribbon 14 inches long. These can all be the same color, or three different colors. Tie the three strands together at one end. Either leave them as individual strands or braid them together. Using the ribbon strands, glue a band around the mouthpiece end. Let the rest of the ribbon hang down for decoration. Select a large, plain, thin paper plate. Do not use a plate with curved edges. Pick a paper plate that is as flat as possible. Cut the plate in half. Roll the half paper plate into a tube. Roll the tube tightly on one end, leaving a small opening for use as a mouthpiece. Role the tube so the other end of the tube is as wide as possible. Staple to secure. Use packing tape along the long edge of the megaphone. Decorate the paper plate megaphone. If this is a home project for children, let them decorate any way they wish using crayons, markers, paint and stickers. If it is for a school project that students will use at a game or school event, decorate the paper plates in school colors. Let those making it color and cut out illustrations of the school logo to glue onto their megaphones. Attach pompoms to the mouthpiece end of the megaphone with ribbon or yarn. Use pompoms in favorite or school colors.